The program is slightly smaller than an A4 size. 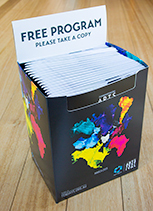 The programs are packaged in a printed box that folds open to an attractive display. Each box contains 20-25 programs.